Starting in Chamonix, The Ultra-Trail du Mont-Blanc is a 168km running race, with over 9600m of elevation change, the trails wind their way up and around Mont Blanc, and takes runners from France, to Italy, to Switzerland, before finishing once again in Chamonix. A truly brutal race for anyone who wishes to take it on, and as Aite was asked to be part of the elite participants for this years race, his own expectations were high, without even having been to Europe, let alone doing any running the Alps! But Aite was optimistic about having a good race, and simply wanted to enjoy the experience, and see how high up the rankings he could finish. His training consisted of months of preparation at different Himalayan training camps with his close friend Samir Tamang, another elite Nepalese runner. Aite then went to France and stayed with another friend of ours (who was running the race also) and had 2 weeks to acclimate, and run parts of the course. I arrived the day before the race, it had been 5 months since I had seen Aite, but once reunited it may well had been 5 minutes. We chatted to well into the night before getting some sleep. In the morning “Game Day” he was calm, and relaxed, if it was me only 8 hours from the start of this race, I would have been freaking out! We went into Chamonix, which had a carnival atmosphere attached to the race, a real party feel, and everyone was celebrating. We were in the mountains, the sun was shining, and the people who lined the streets where there to cheer on the 2500 runners from all over the world. Aite and I went to an Indian restaurant which served the Nepalese meal Dahl Baht, we laughed over our favourite meal, without uttering a word about the race which now started in just a few hours time. We had a coffee before we both agreed it was time to head to the start line. 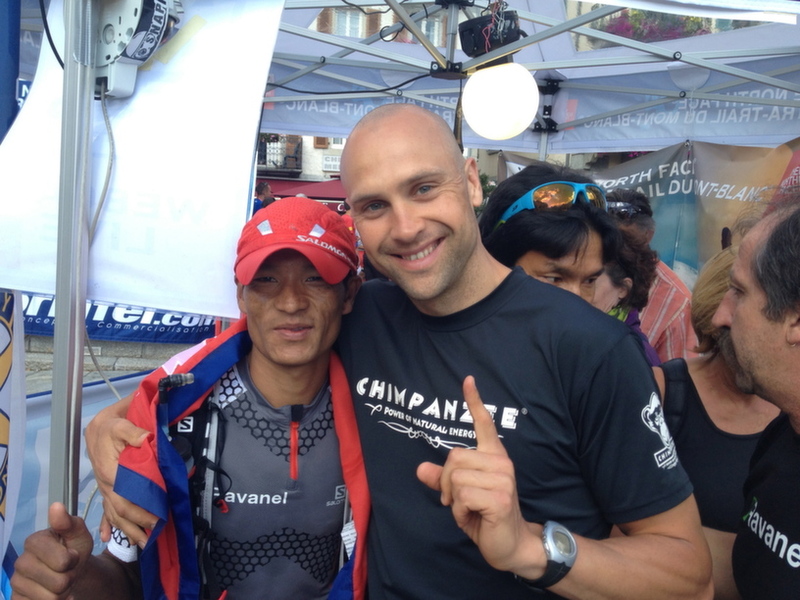 There, we met Dawa Sherpa, the inaugural winner of the UTMB, and multiple podium finisher. 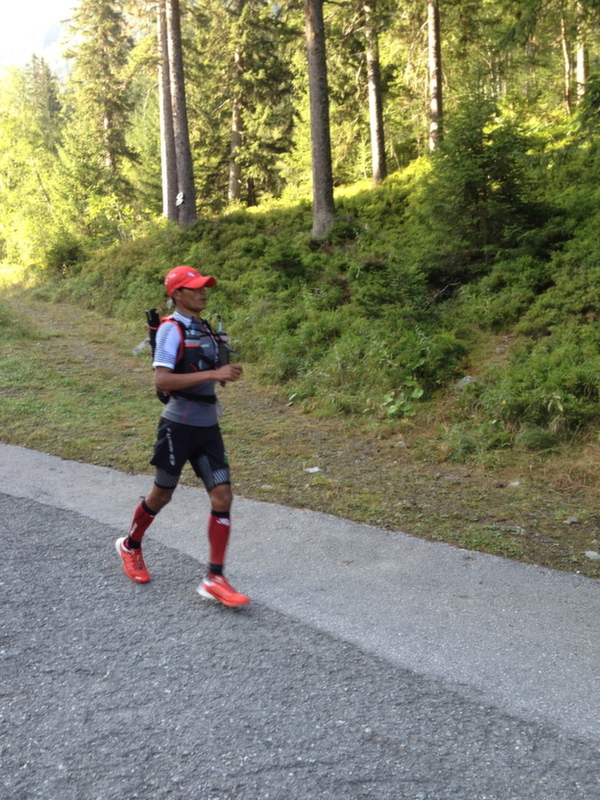 Dawa in his early forties has now retired from competing in the UTMB, but still races throughout the area and does quite well. 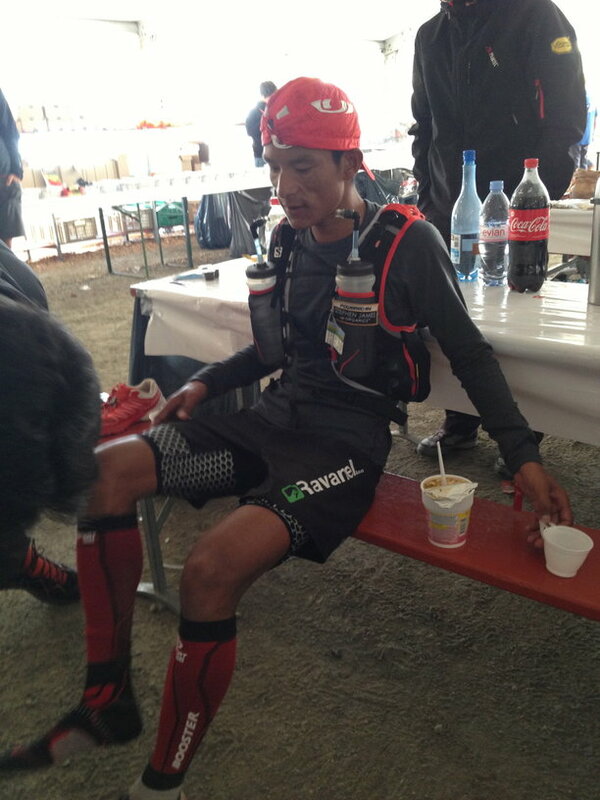 He is also from Nepal, but now resides in Switzerland with his French wife, the three of us would be Aite’s support crew for anywhere between the next 21-25 hours. The starting gun sounded, and everyone was off! Runners went one way, and their support crews went another, the rules of this race are quite strict regarding support, there were only 5 points which are allowed “outside” assistance, the rest of the check points, crews are not allowed to stop at it. Our next 24 hours went like this, go to a checkpoint, set up food, clothes, and medical needs, then wait. Aite would come in, he would eat, give us information on how he feels, always with a smile and a laugh. He would eat copious amounts of noodles, then he would set off, before we do it all over again, I would run with him for 100m after most points, which was always greeted with a smile by my friend. He started cautiously like most of the elite group of runners, he came through the first few checkpoints in between 50-60th position, then as the runners hit their first real test heading up and along the Notre Dame de la Gorge towards Croix du Bonhomme, the elite pack of runners who would be contenders for the race begun to emerge. After a tricky descent, the runners stopped at Les Chapieux, Aite was in 32nd position and looking strong. With another 1000 metres to climb up and over Col de la Seigne, then back down into Courmayeur, the elite runners will have completed 77kms on their arrival. It was 2am when Aite came in, this would be the final checkpoint before Aite had to run through the rest of the night, and not see us until kilometre 108 at La Fouly. At Courmayeur he was in 15th position, and although there was still 90km left in the race, the race was starting to pan out with a few large gaps separating several groups of runners, a top 10 finish was definitely a possibility, but as I said, there was still 90 kms to go. Aite was feeling good, just enjoying the run! The “Aite Tamang” support team managed a 30 minute nap in the car at La Fouly before the sun rose after driving there during the night and setting up for when our runner came through. Aite slowly came into the support tent visually struggling, the cold of the night stopped him from eating and drinking, and he didn’t put on enough clothing to keep him warm (a harsh, but positive lesson for him to learn). He also now had pain in his thigh, he looked disturbed, and unhappy. 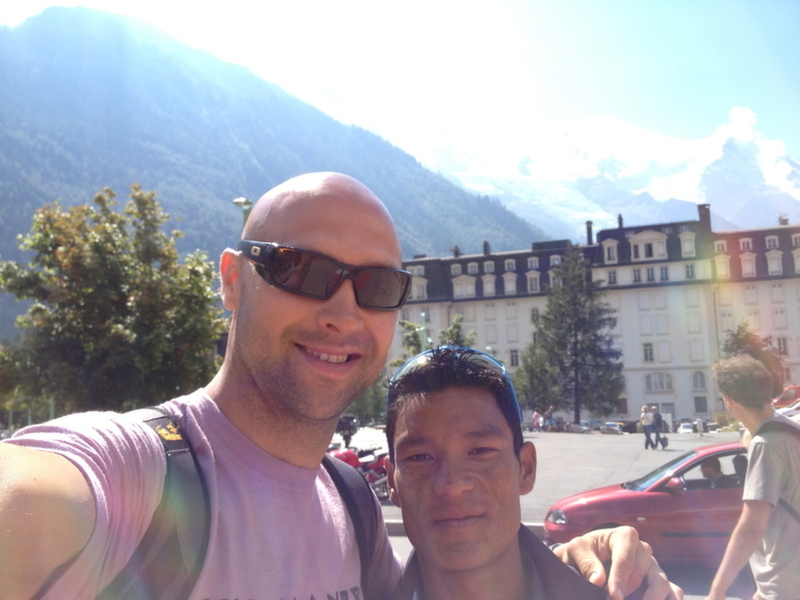 His steely gaze which I saw 5 months ago during his win in the Annapurna 100 had melted. In his first 100 mile race, and after 108 kms, he was beginning to crack, all of us remained positive, and tried to install some focus to simply finish the race. Many strong, and amazing runners have failed at numerous attempts to finish this race, and for Aite his goal now was, get to Chamonix. Leaving La Fouly at 7am with the sun beginning to shine gave Aite a renewed energy, and as we saw him another 5 kms down the road where runners would head across the road leading out of this mountain town, he looked like a new man, the Aite I knew was back! The next 20kms to the following checkpoint was relatively “flat” for this race, and not too much changed in the placings. 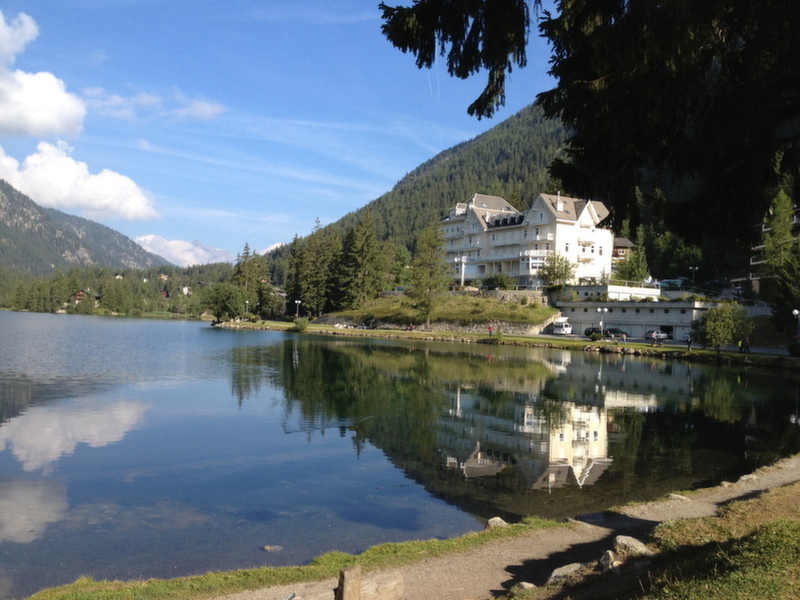 It wasn’t until the leg between this stop (Champex-Lac) to Trient where things started to get interesting. 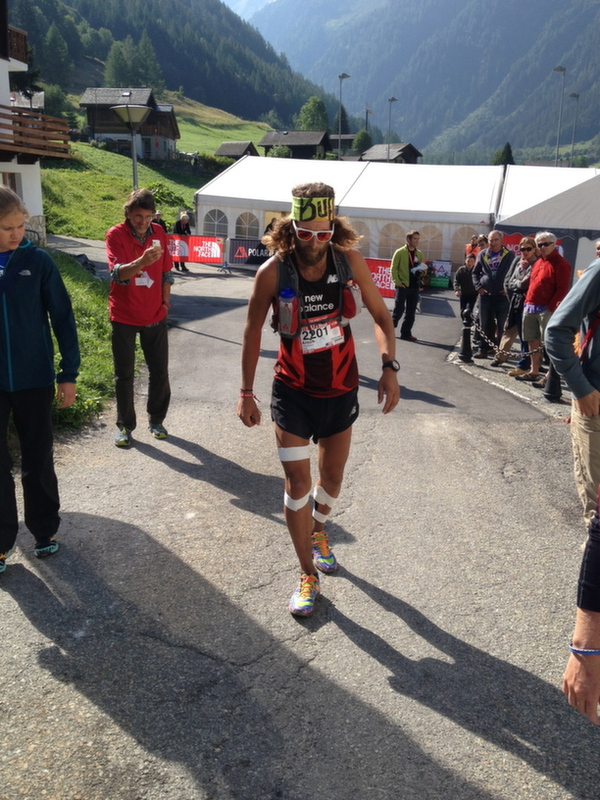 At Trient, 30kms from home, one of the race favourites, the charismatic runner out of Colorado Anton Krupicka, who was leading for much of the race was in the support area and in visual pain, he had bandages around his ankle and hamstring. He was struggling big time, although he had won some of the biggest races in North America, and completed many 100 mile races, but at his first attempt of the UTMB he was forced to withdraw. We told Aite this as he came through in 15th position, hoping to give him confidence to simply finish, he was as surprised as we were that Anton had to pull out. He left tired, in pain, sore, not feeling great, but in good spirits. 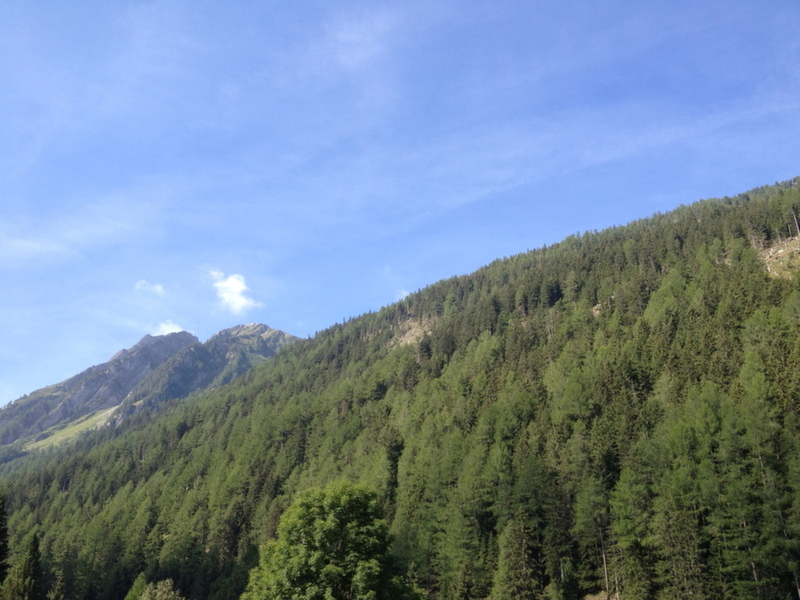 The sun was shining, it was a glorious day in the Alps, Aite had another flattish stretch before the final support point before the finish in Chamonix. As he came into Vallorcine, we cheered for him, he was less than 20kms to the finish, we were all very excited for him, it was a very positive environment as we all knew what was ahead. There was one final climb and descent to test out these runners, like the course hadn’t been difficult enough, 15kms from the finish there was a 900m climb. There was a point we could stop and cheer the runners on as they passed across a road onto the final stretch before Chamonix, Aite was now in 12th position, wedged between two runners less than a minute ahead and behind him. Another runner in the top 5 had pulled out with less than 10kms to go, he was simply unable to continue, after 160kms his body shut down, and couldn’t go any further, this is The UTMB! 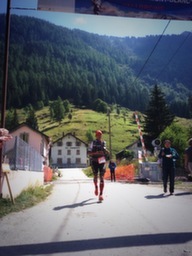 We headed to Chamonix to see our friend finish this race, and what looked to be a top 15 finish. The town was a buzz with people cheering every single runner as they snaked their way through the packed streets of this skiing town. Then he appeared, jogging down the middle of the road, my mate, cruising along, soaking in the atmosphere. As he came up beside me I handed him a Nepalese flag and screamed “you did it, brother, you did it.” Dawa and I ran alongside Aite for a few hundred metres before darting off through the crowd to meet him at the finish line. It was very emotional for everyone involved, Aite Tamang from Nepal had finished the UTMB at his first attempt in 13th position, amazing! He doesn’t like a whole lot of attention post race, so after a few pictures, we quickly got him out of there and over to a friends house to relax and unwind after his spectacular result. As Aite and I sat and enjoyed a well earned beer in a Jacuzzi overlooking snow capped peaks, we chatted like it was any regular saturday afternoon as two friends shared a drink and plenty of laughs, but one had just competed in a gruelling 168kms running race around a mountain, the other chasing him in a car for 23:50hrs that it took him to finish, maybe not just any ordinary Saturday! 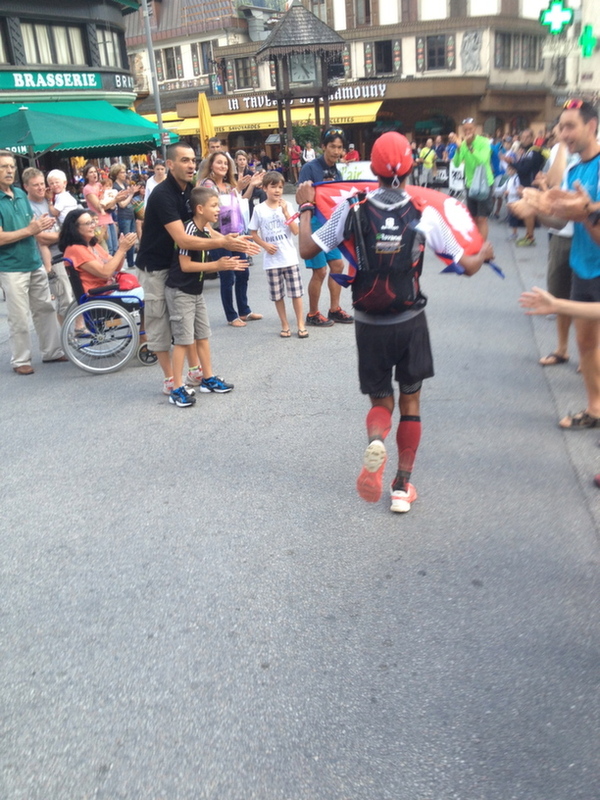 The winner, a young French man by the name of Xavier Thevenard finished in a staggering 20:35hrs, a truly amazing race! We were very proud of Aite, and his accomplishment, as were the organisers equally impressed with his performance, an invitation was given for us all to come back next year and do it all again! Link to Aite’s Checkpoint times. Whats next you may wonder for Aite, Well, myself and a few other people have started a charity for Nepalese runners, based out of Hong Kong, it will be launched officially very soon. The Charities goal is to provide a means of support, education, and guidance for these extremely talented runners from Nepal, and help them compete in races like The UTMB, and other big races around the world on a regular basis. The first race being The Oxfam Trail Walker 100k team race in Hong Kong on November the 17th. 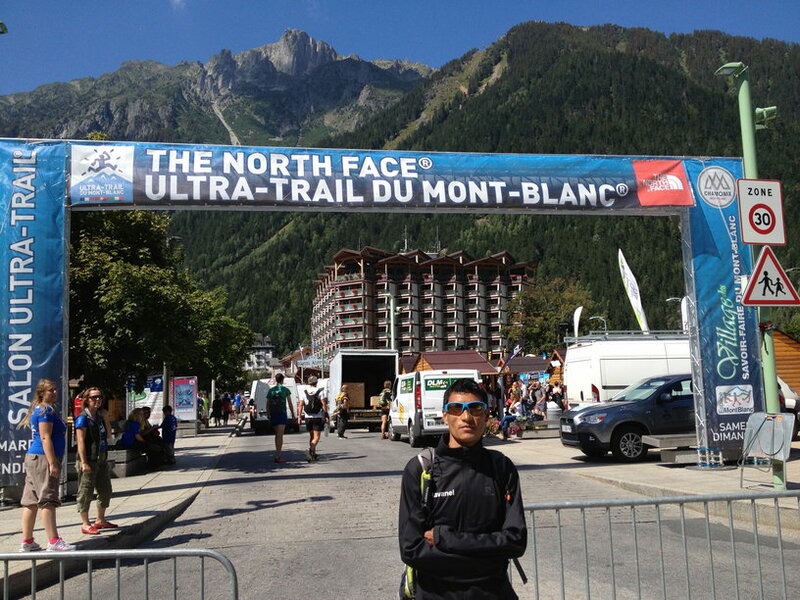 Aite and 3 other Nepalese runners will be representing Team Nepal! The website should be up and running very soon, as of writing we are still short on funds to get these runners to Hong Kong. If you are interested in sponsoring a runner, or donating running kit, or cash in order to help these talented athletes get to the start line of the first official race for Team Nepal, please get in touch with me on the below address.